Excellent solvent for thinning oil painting mediums and for general painting, including studio and brush cleanup. 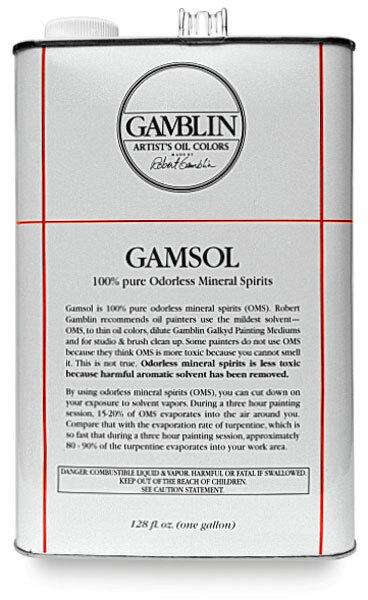 Flashpoint 145º F.
Gamsol is 100% pure odorless mineral spirits (OMS). Some painters think OMS is more toxic because you cannot smell it. This is not true. Odorless mineral spirits is less toxic because harmful aromatic solvent has been removed. By using odorless mineral spirits (OMS), you can cut down on your exposure to solvent vapors. During a three hour painting session, about 20% of OMS evaporates in the air around you. Compare that with the evaporation rate of turpentine, which is so fast that during a three hour painting session, approximately 90% of the turpentine evaporates. 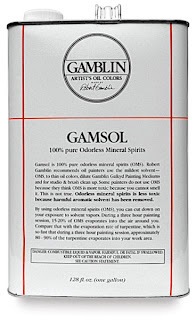 If you are thinning your oil paint with Gamsol, remember that a little goes a long way.